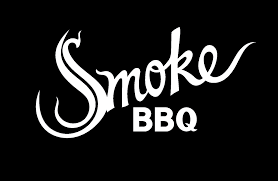 Opening in 2015, Smoke BBQ restaurant has been providing what brothers Roland and Michael Feldman call “Elevated BBQ.” This “Elevated BBQ” concept brings together the Carolina culinary tradition of smoking meats with the artistry found through using fine dining techniques. We interviewed Chef Roland who told us about his lifelong exposure to smoking meats, his own cooking style's evolution and what it takes to pursue a culinary career. 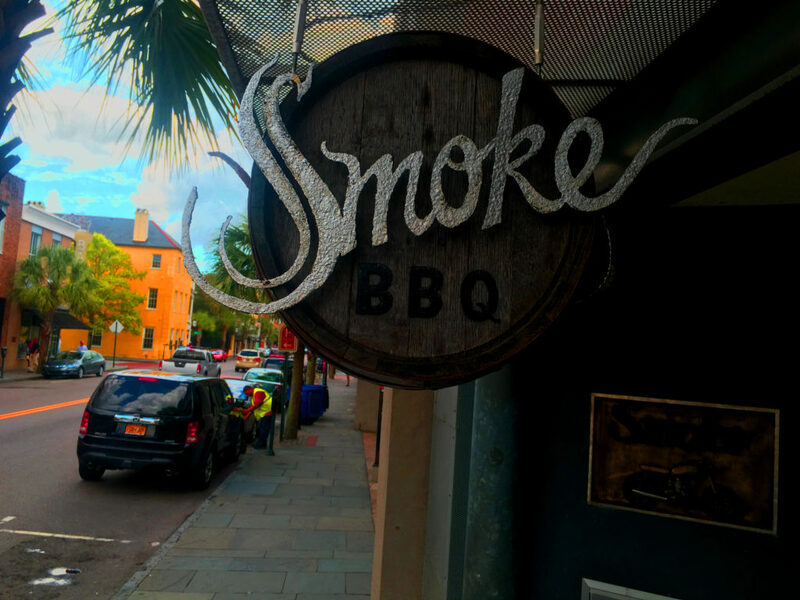 Chefs of Carolina: Were speaking with Chef Roland Feldman, co-owner of Smoke BBQ. How are you today Roland? Roland: I’m great, thank you. 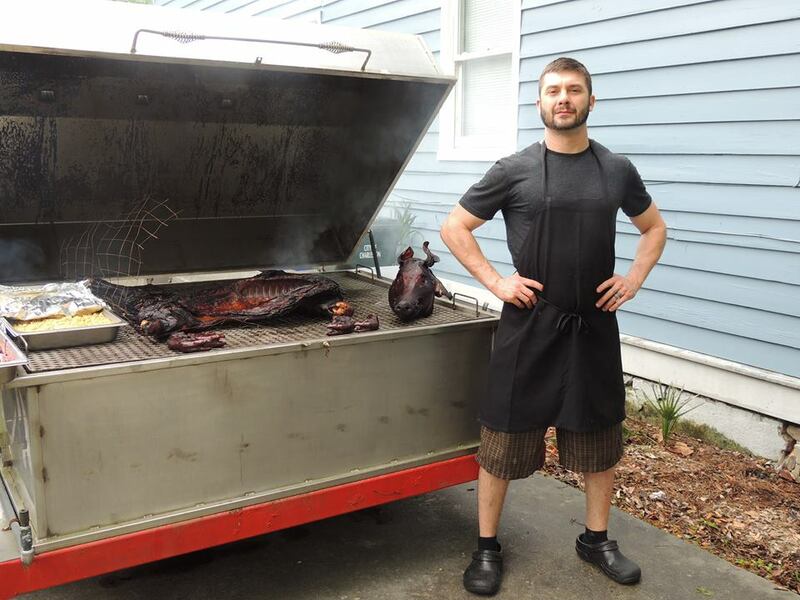 Chefs of Carolina: Roland, tell us a little about your background. Roland: I was born and raised here in Charleston, growing up on the Stono River, being exposed to some of the natural elements of South Carolina, and Charleston in particular. There I developed a love for hunting and fishing and smoking meats. I attended Johnson and Wales University in Denver, Colorado and worked with some extremely talented chefs. Jennifer Jansinski was really my first true influence. After working in Denver for about five years in Denver, I returned to Charleston and worked with Graham Dailey at Peninsula Grill. That’s where I learned I lot about French technique. Sometime after that, I was about to change career paths when we started the Smoke BBQ food truck. We thought that to make an impact here in Charleston we needed to apply all those fine dining techniques to BBQ, maintain the simplicity but make it a little more colorful, a little more vibrant. Chefs of Carolina: What is the first think you remember cooking or helping to cook? Roland: Smoking beef ribs with my dad. Probably because I loved it so much, that’s what I remember. Chefs of Carolina: Is that where your love of smoking meats comes from? Roland: Well, I always considered myself as a campfire kid. When I was young, my dad would take us camping and we’d smoked meats such as trout and when I’d come home, I wouldn’t shower for a day when I got home because I wanted to go to school smelling like campfire. I love the smell of oak and hickory burning. Roland: Yeah, the “Elevated BBQ Concept” is keep things simple, is time loves smoke, is keeping with Carolina and Southern tradition, but applying fine dining techniques to make the best BBQ. We do things like basting our meats through out the day with (Eastern) North Carolina sauce, which is a nice pepper vinegar sauce, to moisten the meat. We put those little extra things like that and feel like the love we put into our product makes it radiate and makes it taste better. Chefs of Carolina: What are some of your locally sourced ingredients? Roland: When we do whole hog roasts we go up to Burbage’s Meats and I’ve worked with Thomas Legare (Of Legare Farms) a lot. So we get a lot meat from Thomas, who is a really great guy or from Burbage’s Meats out in Ravenel. We get some of our produce from GrowFood Carolina, especially for catering and we use Limehouse. We also use Geechie Boy Grits and Brown’s Court Bakery, which is the best bread. But I’m always careful not to label Smoke BBQ as farm-to-table. You have to balance practicality, seasonal availability, space to work in, certain ingredients and cost into making a viable business. We do source our wood here in the Carolinas. With our BBQ we use primarily hickory wood that we source from Gabby’s Firewood in Batesburg-Leesville, SC. They drop off massive pallets to us and they’re great! And I love hickory and hickory is my first choice for pork any day. I think if hickory is used properly has the sweetest, most prevalent flavor and that’s something I really appreciate. But I do think that mesquite from Texas is God’s gift to beef. Chefs of Carolina: Tell us about your BBQ spice that you use in the red sauce and on your homemade pimento cheese sandwich. Roland: The foundation of BBQ spice is chillies, dried and ground, unsmoked and smoked paprika, garlic, cumin, mustard seed, celery seed and of course we have our own variation. Chefs of Carolina: Roland, you use a bit different technique with your chicken wings. Can you elaborate a bit on the process? Roland: We confit chicken wings here with a process of brining them, smoking them, then cooking them in their own fat and then we flash fry them to order because that is the best way to treat the wing and keep them moist. We tell people our wings have no choice but to behave because of how we treat them. Chefs of Carolina: Ha Ha. That’s funny. Tell us about your Brisket Hash. You put it on your grits rather than what’s traditional, which is rice. I’ve tasted this hash and it’s incredible with the grits. Roland: Yeah, a lot of BBQ restaurants are able to utilize some of the scrap into making hash. Essentially you take what I call the delicious parts, the gristle, the crispy fat, the skins, the edges that got a little too dry and you grind it up. We harness a really rich meat juice from all of our bones, any bones, pork bones, chicken bones, any bones that come through this restaurant we use. We make a stock with the bones than reduce the stock then we add the ground product and you simmer it down which is really more like a stew. Then in the end we spike it with our homemade ketchup and increments of our red and mustard BBQ sauces. Also, don’t get me wrong, rice is great, but we use Geechie Boy Grits milled on Edisto, it’s just better and which like you said is incredible. Roland: We needed a new sandwich and I was thinking about what ingredients we had in house that we could use for the sandwich and then I thought, everybody loves a good sloppy joe. So we set out to make our sandwich extra sloppy. And since its Smoke BBQ, we decided it needed Brisket Hash to which we added the slaw, then we put pickles on it to tie it all together. But it still needed a sloppy cheese element to it so we put the pimento cheese on it to take it over the top. We ask people to fasten their seatbelts before they indulge in this sandwich. Really, I love seeing these bachelorette parties come in and the girls are all incognito and on their girl-time mission and want to be bad so they all order Sloppy Smokes. It’s really a beautiful thing for us and them. Chefs of Carolina: What is the process for your smoked beef brisket? Roland: Give credit where credit is due. Texas is the king of brisket BBQ and we play to that by smoking brisket at a very low temperature upwards of twenty hours with a black pepper based crust. We baste it with a pseudo-demi glace made from the drippings, then we basted it with those drippings again right before we serve it. Chefs of Carolina: And you incorporate this beef brisket into your Beef and Chedda sandwich. How is that sandwich put together? Roland: Yeah, our brisket goes on our Beef and Chedda and we put a little of our red sauce on it along with the cheddar ale sauce and house made pickled jalapeños. Roland: We take a lot of pride in the Pastrami Brisket. We take a corned beef brisket and then we smoke it for upwards of 12 hours, then we shave it and crisp it on the flat-top. Then we get to use this great meat, shaving it for out Pastrami Rueben. Chefs of Carolina: And what do you pair with the pastrami in the Rueben? Chefs of Carolina: You like myself grew up on Carolina Mustard BBQ Sauce, but do you have certain sauces you like to pair with certain meats? Roland: Well, we like to consider our meats to be a “Sauce Less BBQ.” Through the brining, the rubbing and the love we give to meat, it doesn’t need a sauce to dominate it. I hear the question all the time, “What kind of sauce?” and it makes me feel that if your meat is not moist or juicy enough not to need a sauce right off the jump, then you didn’t do it right. It’s an expensive commodity, the protein, so it needs to be smoked at a low temperature for a long time while maintaining its juiciness and flavor. That being said, we make great sauce. Our red sauce is reminiscent of Kansas City. Its our homemade smoked tomato ketchup spiked with molasses a little orange juice, BBQ spices. Now that sauce I prefer on brisket. We make an outstanding pepper vinegar sauce, very lightly using our homemade smoke tomato ketchup. It is very reminiscent of the traditional classic sauce but we are layering flavors with our homemade ketchup. One of my favorite sauces is our classic Carolina Mustard BBQ sauce. Now the mustard BBQ sauce I like on chicken and I like it on pork. Chefs of Carolina: Sounds like you’re a firm believer in dipping sauces rather than slathering. Roland: That’s the way it should be. If you take chicken wings that are put through our process of brining, smoking, confiting and flash frying them, why would you toss them in a sauce? When you spend all that time smoking brisket for twenty hours, why would you immediately lather it in sauce? Chefs of Carolina: As a chef, what is your favorite culinary utensil or tool? 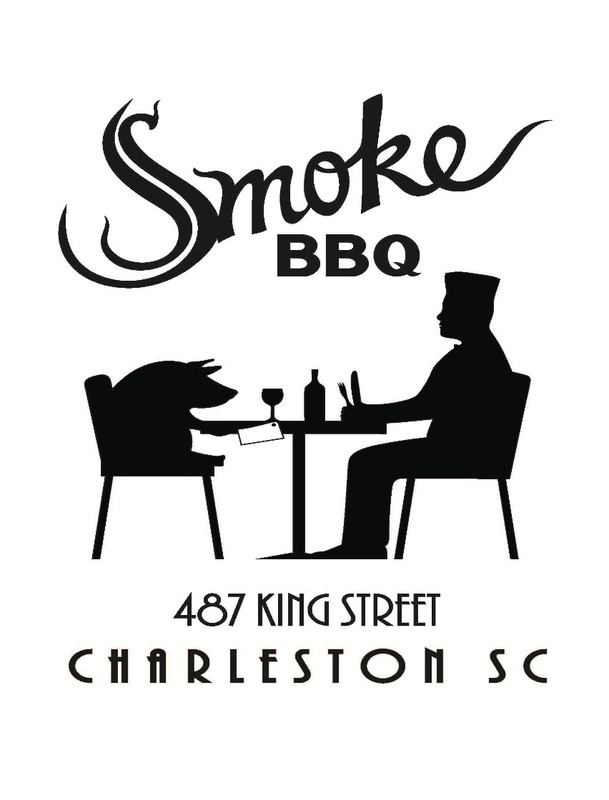 Chefs of Carolina: What is your favorite food and beverage pairing here at Smoke? Roland: I think the best pairing here at Smoke BBQ is a local beer and BBQ. I personally don’t drink anymore but I know that nothing goes better together than a great local beer and one of our rich sandwiches. Chefs of Carolina: What’s your favorite thing to eat at home? Chefs of Carolina: Ha. That’s funny but you’re a salty guy, growing up on the river, so that makes sense. What’s some advice you have for aspiring chefs? Roland: Put your ego aside and absorb everything you can and understand whether or not you can relate to it at that moment You can often apply it later in life. A lot of information you get at one time you didn’t think was important becomes extremely important at a later time. And be patient. And if you want to pursue having a business, be incredibly consistent and honest and open. Set the dream in your head and take steps toward it in a confident manner. Always be able to adapt and expect people to want your attention all the time because if you choose this path you are obligated to serve a lot of people. So if you’re not ok with that, go ahead and choose something else to do. Chefs of Carolina: Do you have advice for home cooks? Roland: As far as BBQ, make sure you know you’re in it for the long haul. You’re going to be smoking at 225 degrees or less for at least 12 hours. Be committed to that process and fall in love with that process. Just don’t try to rush the BBQ or you’ll end up wasting a lot of money on your meat. Chefs of Carolina: Thank you Roland, we appreciate it. Roland: Thank you. It was fun.